Superior Panel Technology is an innovative manufacturer of aircraft cockpit lighting systems (including our patented FiberLite Aircraft Instrument Lighting System and our glare shield Glow Strip electroluminescent lighting system), light dimming systems, light flashers and other aircraft panel accessories that improve the look, function and/or comfort of the aircraft cockpit. Our new product "EZ Nuts" make the installation of aircraft instruments much easier. After using EZ Nuts you will never use the cage (grasshopper) type nut again. We recently added a wide selection of hard to find COLORED Mil-Spec wire that will make the wiring of your project much easier. We think you will find our wire price and selection to be the best available. A major GA Aircraft manufacturer was so impressed with our inflatable lumbar supports that they order 2000 of them to put into every seat of their new aircraft! This FAA burn tested and approved product can make those long flights much more comfortable. Thanks again for taking the time to review our website and fly safe! FiberLites now has STC/PMA approval!! Click on the links above or on the pictures below for more information. Innovative aircraft instrument lighting system that uses fiber optics to evenly illuminate your instruments. Just a few of the advantages of using FiberLites over other lighting are: 1)even, 360 degree lighting around the instrument, 2) long lasting LED light sources, 3) very low current draw, 4) illuminate text on panel with FiberLite label strips. Finally, an instrument mounting system that takes the frustration out of mounting aircraft instruments! Unlike the "Cage-type" Nuts, the E-Z Nuts bezel is securely held to the backside of the instrument during installation. It will not fall off and get lost during installation. Available for both 3 1/8" and 2 1/4" round standard sized instruments. Once you use E-Z Nuts you will never use the "Cage-type" nuts again. Includes four 1 1/2" black stainless steel pan head screws and four black nylon washers. The longer screws are often needed when you use a bezel lighting system such as our FiberLites. Superior Panel Technology has developed three new, compact solid state Pulse-Width-Modulation (PWM) dimmers to meet all aircraft dimming needs. They are extremely easy to install (one terminal screw for power in, one for ground and the third for power out), minimal heat dissipation, and by choosing the right dimmer (EL/LED Dimmer, Heavy Duty or Extreme Heavy Duty) you avoid the “dimming steps” in brightness that is often found in other PWM dimmers. The EL/LED Dimmer would be used for LED's and electroluminescent lighting such as SPT's Glow Strips. The Heavy Duty dimmer can handle up to 100 watts. The Extreme Power dimmer can be used for up to 400 watts @ 28V or 200 watt @ 14V! These dimmers have the smallest footprint on the market for a PWM dimmer with a built in circuit breaking off switch. SPT offers a industry leading 5 year warranty on their PWM dimmers!! Economical solution for the dimming of interior aircraft lighting. Choose from either a one, two, three or four dimmer control. These heavy duty 115W solid-state dimming kits will evenly dim a variety of lights including LEDs, electroluminescent and incandescent bulbs of different amp and wattage amounts. The complete, compact, light weight solid state dimmer. Voltage range 12 to 35 VDC. Maximum current 12.5A. Superior Panel Technology offers the best price available on this new product! Two channel control dimmer in a single, neat, compact, light weight unit. Controls LEDs, electroluminescent and incandescent lighting. Especially useful when you don't have room to add a second control on the panel. Superior Panel Technology offers the best price available on this new product! Bright, fluorescent-type lighting that is only 1/16" in thickness. The electroluminescent Glow Strips produce a very nice fluorescent-type, greenish-blue light that is easy on the eyes. They can be used in a variety of interior lighting applications. Installation is quick and easy. The BattPack Battery Backup System can be used for emergency/secondary power source for aircraft lighting. 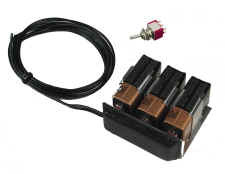 The 14 or 28V system will provide up to one hour or more of lighting for the FiberLite instrument lighting system (that uses LED light sources) or the Glow Strip (electroluminescent lamp) glare shield lighting system or for other low current draw lighting such as internally lighted instruments. The system includes the battery holders, engraved placard and tefzel hook up wire. 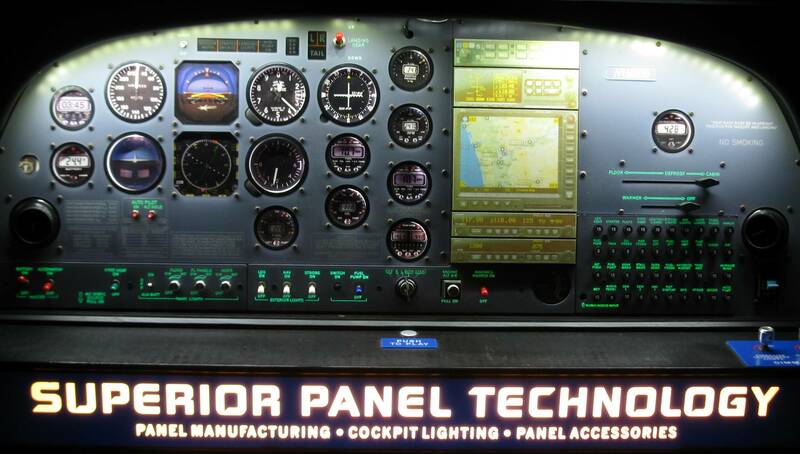 Superior Panel Technology has developed a brighter, wide-angle LED Light strip for aircraft panel illumination. The 39” LED light strip includes 60 wide-angle white LEDs. The LED light strips are adaptable for both 14V and 28V aircraft and can be cut as needed. When on full power, it produces a nice flood light that is amazingly bright and produces enough light to read charts. The LEDs are fully dimmable using the SPT Pulse-Width-Modulation (PWM) dimmer that was specifically designed for the low current draw LEDs. The dimmer allows for a gradual dimming without the brightness steps often found in dimmers not designed for low current draw items. The very compact dimmer is only 1” wide and is VERY easy to wire. There is a + (power in), - (ground) and terminal for power out to the lights! The MaxPulse is a solid state landing light controller. The small size and one ounce weight places this controller in a class of its own. High current capability, low temperature operation, extreme long life, noise free operation and small size makes it an ideal landing light controller for all aircraft. 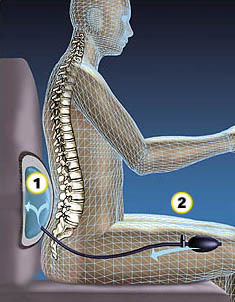 The inflatable pillow can be installed under the seat material or placed behind your lower back. The pillow conforms to the lumbar region of your spine and gives you customized support just where you need it. This additional customized support improves disc mechanics, increases flexibility and movement, decreases muscle stiffness and increases blood circulation to facilitate the healing of injured backs. Dress up the appearance of your panel and help to identify your switches by color coding your toggle switches with vinyl covers. Available in green, yellow, white, black, red and blue for the standard size and red and white for the mini sizes. These 1" x 1" zip tie cable mounts come in very handy to neatly secure wire bundles and cables. The mounts come with an acrylic adhesive foam backing and also have a screw hole in the center for additional security when needed. The zip ties can be threaded through the mount on any of the four sides of the mount. Sold in packages of 25 for only $6.25. Every homebuilder will want to use these handy items! 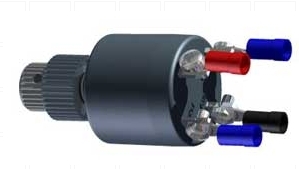 Make your panel a "Plug and Play" panel with these heavy-duty electrical connectors. 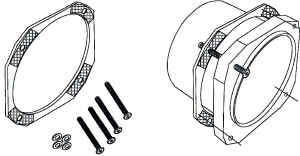 The connectors are designed for either panel mount or free hanging. 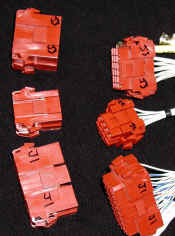 Connectors are available in 4, 6, 9,12,18, and 36 pin configurations. Choose the pins and sockets based on the wire size. The pins are top quality and are gold/nickel plated. Double click on the picture for more details. Seal-All Connectors are an environmentally sealed connection system developed to withstand exposure to extreme temperatures, moisture and harsh engine compartment fluids and chemicals. A variety of connector configurations are available from one to six conductors. Terminal kits are available in 24 to 10 gauge wire. 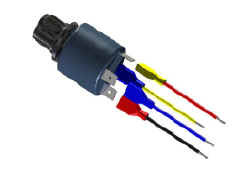 Now you can have the same superior Plug/Connectors used in vehicle OEM manufacturing. Improve the appearance of your aircraft and protect the instruments and panel with the Superior Panel Technology's Glare Shield. This kit provides the materials to produce a professional custom padded glare shield. The material used in the kit has passed the FAR 25.853 burn requirements and a burn certificate is provided with each kit. Receive a $10.00 discount for the SPT-Glow Strip lighting system with the purchase of a glare shield kit. SPT searched high and low to find a source for a soft leather-like vinyl material that would pass the FAR23.852(a) flammability requirements at a reasonable cost. We finally found it! Superior Panel Technology's Leather Like Vinyl has the ultra-soft leather feel without the leather cost. It can be used for seats, wall panels and headliners. The flame treated material meets FAR23.853(A) flammability requirements. It provides superior wear resistance, abrasion resistance and excellent tailorability. We carry the seven most poplular interior colors (sand, iron gray, blueberry, cream, cranberry, black and coffee). We will send you a free sample as we know you will love this material! This ABS thermoplastic fire-rated material can be used as a base material for the making of glare shields and side panel backing. Easily cut, drill, saw and grind this ABS sheeting. The plastic sheets have excellent ductility and formability. Unlike other ABS sheeting, this material meets FAR 25.853 burn requirements. Smooth flat surface on one side and a matte finish on the other side. Color is black. Sheet size is .063"x23.5" x 54". 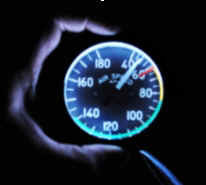 Replace burnt out Grain of Wheat Bulbs that are used to illuminate many instrument panels and instruments. These blue-white silicone booted lamps are filtered for illuminating integrally white-lighted aircraft instruments and panels as called out in MIL-L-27160. Available in both 14V and 28V.